Meanwhile it is the day before yesterday, when the KDE Community released KDE SC 4.4 and yesterday, when Kubuntu published the packages. It is great to see how the desktop environment matures and still getting new and terrific features. One of the finest features – i think – is window tabbing. It is as simply as that: you pick some single applications and group them in one window. Actually, i enabled it only few hours ago, but generally i am thinking of grouping applications for a certain, specific task, but also grouping applications for a superordinate purpose. Like communication. 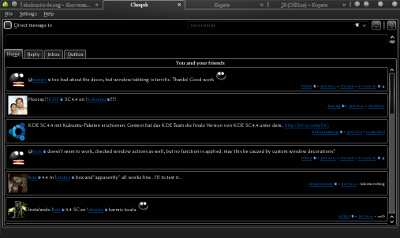 In the following screenshot i arranged all real-time and micro-message programs, which are Konversation (IRC), Choqok (Identi.ca), and Kopete (Jabber and stuff). 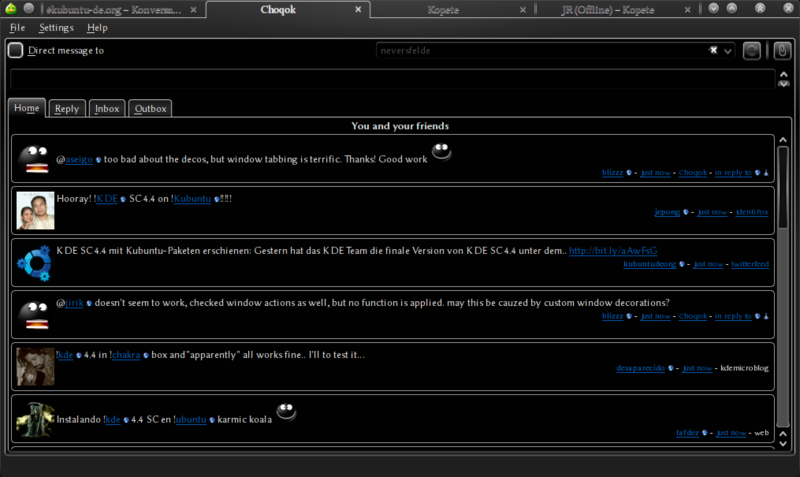 Great thing is that if I open a chat window in Kopete it is sorted automatically (like JR). There is a downside, though. I use to customize almost everything, including window decoration. However, not every window decoration is capable of window tabbing. In the moment you need to use Oxygen or Tabstrip, which I have done. Sometimes, functionality wins over beauty ;) An obstacle I had to take was also how to group the applications, without using the taskbar (i don't use one). Simply drag and drop with middle mouse button. Possibly, you need to check wether "Middle Button" action is set to "Start Window Tab Drag" in System Settings → Window Behaviour → Titlebar Actions. Thanks to @jirik and @aseigo, of course!